The Consolidated Billing Summary Report shows you daily and month-to-date statistics for each of your consolidated AWS accounts. The totals for this report are taken directly from your AWS invoice. The Consolidated Billing Summary can be based on CloudWatch data or on your Detailed Billing Reports. Detailed Billing Reports are only available for CloudCheckr Pro accounts and include details such as costs, credits, net bill, tags, and service type. both Bill Monitoring and the detailed billing reports must be enabled before you can utilize the Consolidated Billing summary. Month-to-Date Net Bill: the current total of the monthly invoice for that account. Net Bill is calculated by taking your Costs and subtracting any Credits. Month-to-Date Cost: the current total of the monthly costs for that account. Costs may not match your AWS invoice as they do not account for Credits. Daily Net Bill: the total net bill for the last complete day. Daily Cost: the total Cost for the last complete day. This report also allows you to sort by the same options and select cost type. CloudCheckr provides you the ability to save any of your filter configurations within the Consolidated Billing Summary report. To save your filter options, click the Save As New Filter button. You will be asked to name your new filter. Once that's done, your filter will be available in the Saved Filters drop-down menu at the top of the report. Total Number of Accounts: the total number of consolidated accounts. Total Daily Net Bill (Last Full Day): the daily total invoice for all consolidated accounts. Total MTD Net Bill: the current total of the monthly invoice for all consolidated accounts. Total Predicted Bill: the projected end-of-month Net Bill based on current month-to-date usage. Average MTD Bill (per account): the average monthly invoice for all consolidated accounts. Average Daily Bill (per account)>: the average daily net bill for all consolidated accounts for the last complete day. Average Total Daily Bill (all accounts): the average daily net bill for all consolidated accounts for the current month. Last Full Day: the last full day (through midnight) of cost data available from AWS (whether you are using Detailed Billing or CloudWatch). The data within the report is reflected through this day. By default, the report will show statistics for all of your Consolidated Billing accounts, sorted by Month-to-Date Net Bill. If you have many accounts you can have the report show 10, 25, or 50 accounts at once. The bottom of the report displays your per-account data. MTD Net Bill: the current total of the monthly invoice for that account. You can click any of your accounts to view the Single Day Summary Report for that account. The Consolidated Billing Summary report can be delivered daily or monthly via email, to the addresses you specify. To enable/disable billing summary emails, expand the Account Settings dropdown in the left navigation menu and click on Email Settings. 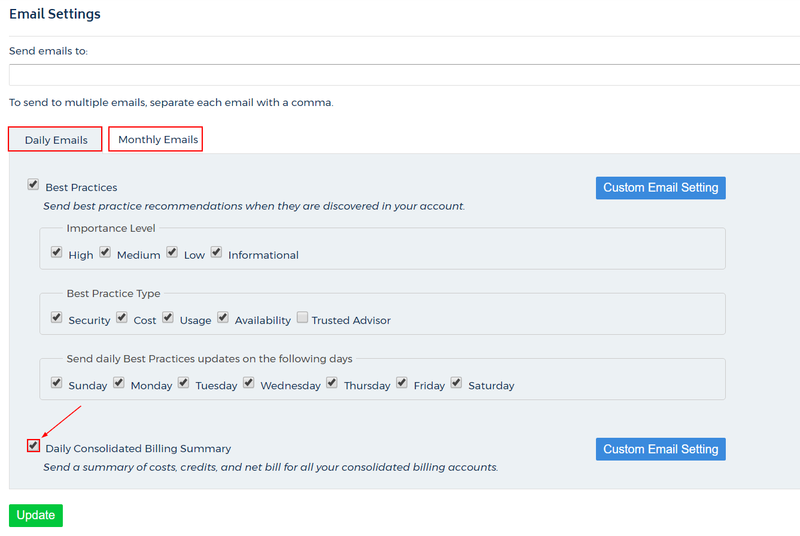 On the Email Settings page, toggle the Consolidated Billing Summary checkbox on the appropriate Daily/Monthly Emails tab. Be sure to fill out the "Send emails to" input field at the top of the page and don't forget to save your changes.